Chris and I were spending our first Friday at home in a couple of weeks. Fortunately we had been in Napa the past few weeks for both work and pleasure. The weather out in Napa and Sonoma averaged 70 and sunny every day. Here we are back in Minnesota and it is COLD and cloudy. It’s really hard to be cheery when it is gloomy outside. The advantage is that we only have 32 days till Spring and the days are getting longer again! 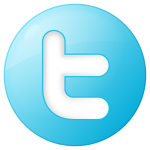 We are looking forward to spring and enjoying the outdoors. The gardens will need some work as do the ponds and water falls. I look forward to hearing the water flow again this year. We started our Friday happy hour with a glass of nice wine. I was looking for something that was slightly different, but “yummy”. I wandered down to the cellar, pulling bottles and contemplating how the wines would taste on its own. 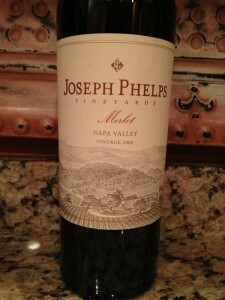 I eventually came across a bottle of 2006 Joseph Phelps Merlot. The bottle brought back a happy memory of June 2011. We were in Napa on a beautiful Sunday afternoon. We had reserved a picnic table for a light lunch before I had to take Chris to the SFO airport for home. Along with our light lunch, Chris wanted to have a bottle of the Merlot as it is one of our favorites! Eventually the time came as it was getting late and we had to get going so Chris could make her 6pm flight. We headed to the airport and were about 20 miles away and the traffic was terrible. We were both becoming a bit nervous thinking Chris may miss her flight. As we progressed we came to the conclusion that she likely was going to miss dinner and would have to grab a quick snack for the flight home. The traffic remained thick and as more time ticked now I was feeling like she may not make the flight at all! Eventually we realized that there was no way she would make the flight. I could tell Chris was happy to spend another night in California with me! So with a quick call to Delta she would fly back Monday morning out of the San Jose Airport instead. I wonder if Chris recalls that trip and how she missed the flight. Needles to say we always schedule an earlier flight and get to the airport early even though it was fun having her miss the flight and stay another day! 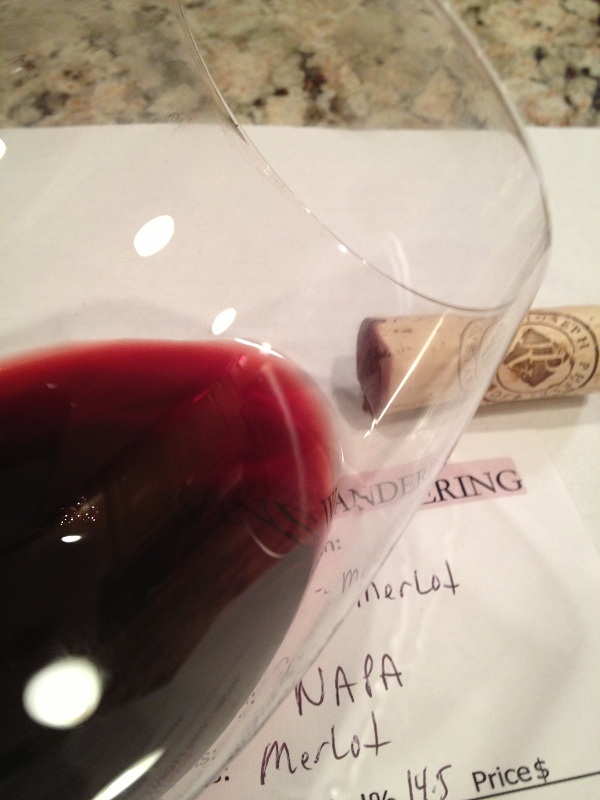 The Merlot has a deep color depth with a nice dark Garnet hue. The meniscus are a nice light caramel. The Merlot was very aromatic and young. We noted spice, oak, cocoa, and dark fruit. Slightly dry and full-bodied. The acidity was right on and my mouth watered wanting more. 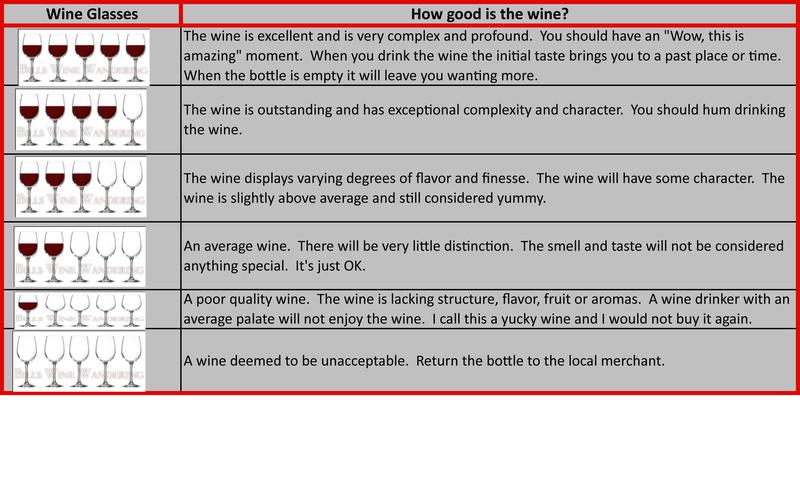 The tannins were medium and not harsh. It was very flavorful and some of the flavors were dark chocolate and vanilla. This wine taste just like it smelled and the finish was nice and long. This Merlot had a Cabernet Sauvignon taste and smell. 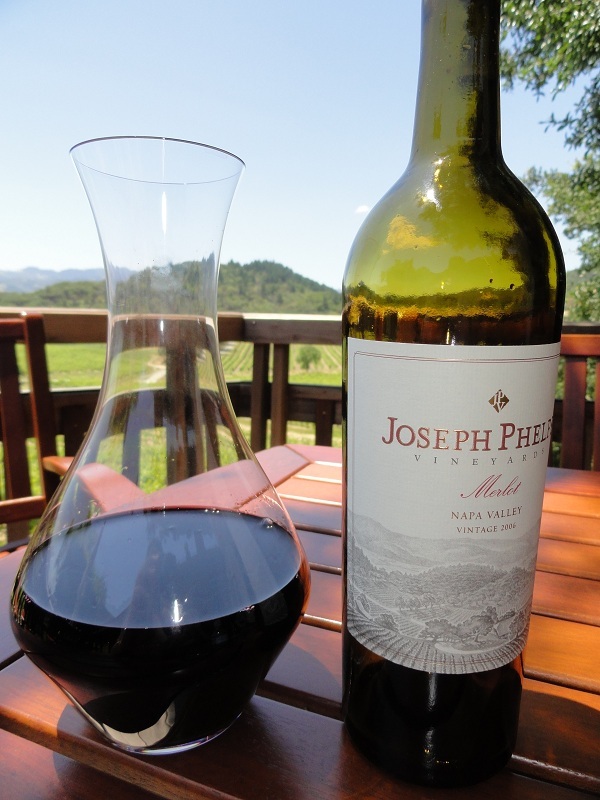 Reading the wine makers notes the Merlot is a blend of 76% Napa Valley Merlot and 24% Cabernet Sauvignon from estate-grown vineyards. We both rated the 2006 Joesph Phelps Merlot four glasses. Drinking the Merlot made me sunny on the inside! 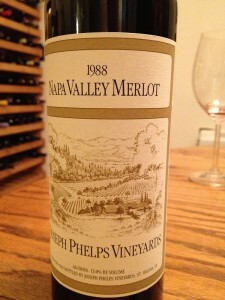 It’s not every day you are offered Joseph Phelps Merlot from the winery. When the offer is there, I always buy a case. 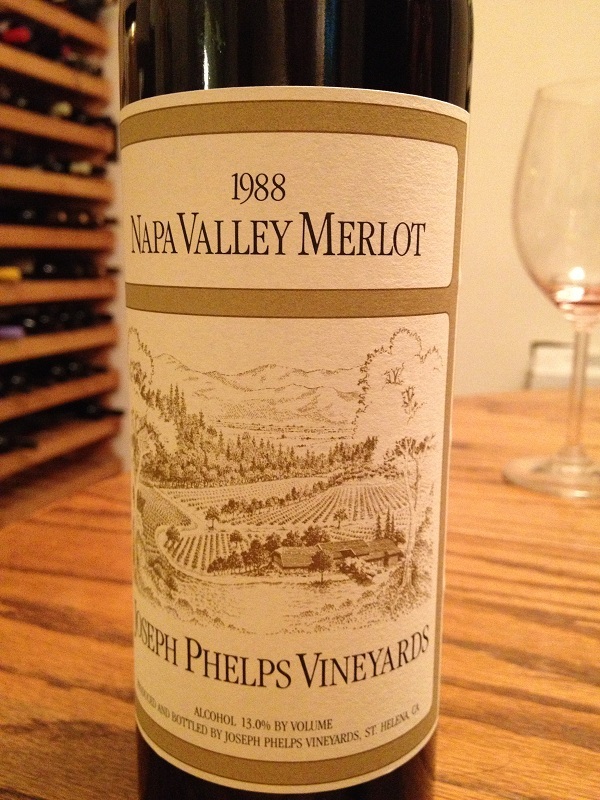 We had the opportunity to try a 1988 Joseph Phelps Merlot a week ago at our friends house in Calistoga. After twenty-five years, it was still holding up very nice. Thanks Robert & Carly for sharing!